Shakespeare is like broccoli. You heard me. The Bay Area Brit has always liked to read, but as a schoolboy in England, I was forced to absorb books that were way over my head. Instead of opening up to the world of Olde England as spake by 14th Century writer Geoffrey Chaucer, I gazed at the text wondering what I could do or say in the melancholic mire to keep my classmates and me entertained. I felt sorry for my fellow pre-teenage students, some of whom may have genuinely been interested in Chaucer’s Canterbury Tales, or Shakespeare’s Hamlet, or Charles Dickens’s Hard Times. At the age of 12, I couldn’t care less. Even if the stories had been interesting to me, what was with all that lingo? My sphincter puckered at the antiquated verbiage. I have recently come to appreciate “The Bard.” To me, Shakespeare is like broccoli. I hated broccoli as a child. It was forced upon me because it was supposed to be “good for me.” Much like Shakespeare was supposed to be “good for me.” In adulthood I have come to appreciate, and dare I say it, love broccoli and Shakespeare. I even like that wretched cauliflower Dickens now. I mean his stories are depressing as hell and I still imagine myself a victim of child labor forced to shimmy up a chimney to clean it every time I read him, but at least I get it now. Chaucer: you’re like Brussels sprouts and are dead to me and can rot. I know you’re “important” but you did nothing but ruin books for me for a very long time. 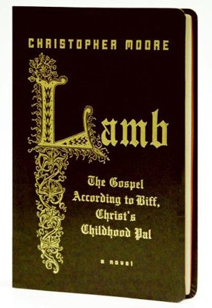 If you haven’t read “Lamb,” and were kept prisoner in Sunday School as a child, this might be the perfect antidote to what ailed you all those years ago. It’s a brilliantly executed story that we are all partly familiar with. Moore fills in the missing blanks from The Bible about Jesus’ life, and does it in a way that even the most ardent Christian might concede believable. I’m just saying that Moore would have made a great apostle were he offered a shot at writing one or more of the gospels. The man can spin a yarn. However, when I finally got around to reading “Fool,” I braced myself (somewhat apprehensively) for some Shakespearean childhood flashbacks. I am often wary when Americans (Moore is originally from Ohio) try to delve too deeply into not only my country’s history but take a swing at the humo(u)r. British humor has its own unmistakable identity. To scratch the surface, it is borne from the works of Shakespeare, Oscar Wilde (although technically Irish), P.G. Wodehouse, Tom Stoppard (who penned “Rosencrantz And Guildenstern Are Dead,” which is Hamlet written from the perspective of two of the play’s secondary characters), Douglas Adams, and Pythons of the Monty variety. Fortunately, Moore is a fan of the genre and is influenced appropriately by the comedic gods from across the pond. He researched Lamb by reading The Bible with an archaeologist’s toothcomb and visited Israel and walked in Christ’s footsteps. Ensuring Fool’s authenticity wasn’t something he could do by just reading up on Shakespeare (which he did). It wasn’t by visiting Britain (which he did). The heart of Fool comes from understanding the British sense of humor; the language he uses is spot on. In the hands of a different American writer, the book might have been overly-peppered with jokes and schtick sold to him by a hackneyed Renaissance Faire Punch and Judy gag writer. Not so with Fool. 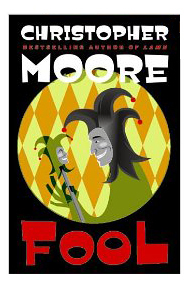 Fool is Moore’s version of “King Lear” as told from the perspective of Pocket: a black-clothed court jester, who is either fully loved or despised by the other characters living in Lear’s court. Moore acknowledges Shakespeare took liberties with timeframes and geography in his play, as he did. As to what responsibility Moore had to steer things back where they belong–the answer is none. As a consequence, Fool is a hilarious and oft bawdy Medieval romp which begs, borrows, and steals from a handful of Shakespeare’s works. Think of Fool as Shakespeare on Nitrous Oxide. Yes, the writer takes liberties all of which he confesses: there are cameos from Macbeth’s witches and Moore uses British slang and American euphemisms with a joyful abandon. At some point I remember vague mention of “the driving out the Mazdas from Swindon.” It doesn’t make sense, but why should it? It’s laugh out loud funny and satisfying to the end. This brought back a memory of you telling me about your first roommate at school… if memory serves, he was reading the biography of Judy Garland when you first arrived. I haven’t the faintest idea how I remember that after all this time. Well remembered. He was the kid in the next bed over in the dormitory at boarding school. He was 10 years old and proof that some kids just know which direction they are headed at a very early age. Honestly, am I ignorant cause I hate the classics? They just bore me. As far as your country men, I’ll take Hume and Locke, them some real thinkin’ mofo’s. I LOVE Lamb. I think I’ll have to read Fool now, too.